AEI Speakers Bureau takes the burden off your back! started and find the perfect speaker for your event. Through personalized, responsive and professional service, we guide you from start to finish to make the whole process easy and fun! 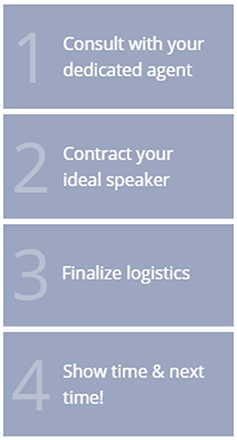 Let’s get started and find the perfect speaker for your event. At AEI Speakers Bureau, our full-time researchers work hard everyday finding speakers for our clients. Give us a name, and we’ll give you the fee, availability, and any available press material. There is no speaker too hard to find! Our agents work with you to pinpoint the ideal speaker for your event. Once you’ve made your choice, your agent will send our Firm Offer Form to fill out with all your event details and once you return it, we will connect with the speaker and get you locked onto their calendar! Once your selected speaker is onboard, our Director of Operations will send you our agreement and start the invoicing process and start collecting the logistical information. Now that you have met our team, it’s time to get down to the nitty gritty! We will work with you and the speaker to get everyone all the pertinent details, coordinate conference calls so everyone is on the same page and arrange for travel. It’s show time!! Time for your successful event! Once your event plays and you see how smoothly everything went, you will be ready to start planning the next one and we will be there ready to help you! AEI has been my “go to” speakers bureau for close to a decade. Your team has always been responsive to our needs—and has made valuable suggestions. I really can’t think of anything to improve upon. AEI staff from beginning to the end made this a fantastic experience! You worked with us as we strived to obtain the donations needed to make this happen! I can’t think of any way you could have made this any easier for myself and the rest of our committee! AEI staff – you were all excellent … Thank you so very much for all your help, guidance and patience!! I have no suggestions on how the AEI can attain a higher level of excellence because the service my command was provided by the AEI staff and the Keynote speaker was nothing short of excellent. Thank you very much for making African-American Black History observance a success. I believe AEI did a fantastic job. I honestly have never been more pleased with customer service in recent memory than I have by the great work done by Mark, Melissa, and Jennifer. Working with AEI reps to book Mr. Wormeli was a pleasant experience. My needs were met and all of the reps were professional and kind. There is nothing that I can suggest that would make the experience better. I plan to try to work with you all again if funding allows!! Thank you!!! You guys were terrific! We will definitely connect again and recommend you going forward. Love working with Mark and the entire team – everything is just so easy!! !